Darwin hoped to make evolution a new religion. It was embraced by Karl Marx1, is taught in our public schools as the state religion5 and is publicly accepted by Pope John Paul II. Yet, the theory of evolution has no scientific basis.6, 7 It derives solely from Darwin’s observations of natural selection as well as countless imaginary drawings. No genuine evidence exists to support it,8, 9 despite the fact that fraudulent and manipulated drawings and specimens are frequently utilized. It is important to define two subsets of the term evolution: micro evolution and macro evolution. Micro evolution refers to the study of minor variations that occur in populations over time as observed in, for instance, the coloration of the peppered moth, beaks of Galapagos finches (Darwin’s observation), and selective animal and plant breeding. Macro evolution is the study of the origin of major innovations. These are new organs, structures (e.g., fish scales evolving into feathers), or body plans. Darwin’s natural selection acting on random variation is a valid concept accounting for micro evolution (e.g., drought-resistant wheat, hip dysplasia in dogs, a shorter race of men resulting from the taller men being lost to the gene pool because of war deaths). But Darwin’s natural selection acting on random variation is invalid when applied to macro evolution10 and macro evolution is basically what the controversy is all about. The theory of macro evolution is supported by omissions, fraud, and deceit to be made plausible. Life arose spontaneously as a single-cell. This cell produced two cells, each identical to the first cell and each capable of growing and producing two more cells. This production process continues for millions of years and the new cells constantly improve in capability and complexity. A spontaneous mistake in this replication process, however, produces a super cell which then produces more super cells. Over time, a two-celled organism is produced. Eons of time are required. Generally constant conditions (e.g., temperature, pressure, sunlight, magnetic field, humidity) with only slight changes. Life forms are gradually molded into different types of organisms (e.g., birds, cactus, ants, polar bears, bacteria, snakes, man). No evidence is available in the fossil record to support any of these assumptions,6, 7, 9 not even for two-celled organisms. Explaining the immense variety in nature is difficult for the evolutionists. The lungfish provides for an interesting example of this. The fossil record shows this organism appearing suddenly. No transitional forms are available to support adequately the theory of its evolution. But admitting there might be transitional life forms yet unfound, how would the lungfish arrive according to the theory of evolution? —A non-lungfish interacting with environmental change turns into a lungfish capable of surviving four years of extreme temperatures (in excess of 130°F) and no moisture. As the weather gradually changes so must the “lungfish in training” —generation after generation, no mistakes, learning to burrow into the mud to a depth neither too shallow, or be baked, nor too deep, or be trapped. It must secrete an exact amount of slime to harden into its protective covering and lower its heart rate to one beat every 10-20 minutes. During this evolutionary training period of, let’s say, 30 million years, the weather must change gradually.... What would happen if after 15 million years the lungfish trainee has only learned to burrow up to its pectoral fins? If it doesn’t rain sufficiently, the animal’s tail will get quite a suntan! The mechanism for lungfish survival is a tricky problem for evolutionary biologists. Thousands of unanswered problems like the lungfish exist for the evolutionist. A new theory, however, “punctuated equilibrium,” has been proposed to help evolutionary biologists through these difficult problems. Punctuated equilibrium proposes sudden leaps in animal forms. For example, chickens lay eggs hatching into chickards (e.g., half-chicken, half-lizard). A current eighth-grade science book attempts to provide proof for the punctuated equilibrium theory. It cites examples of a certain snail shell which undergoes dramatic changes in its shell opening and spiral. The student is taught that this accelerated evolutionary change took only a few hundred thousand years, a drop in the bucket for the evolutionist. The identical changes have been observed in 3½ months in a classroom aquarium caused by a buildup of calcium carbonate in the tank! Evolution of species from a common ancestor produces more problems for the evolutionists. Their creative imaginations and artistic imagery, however, reveal that nothing is impossible. Even the mathematically impossible becomes their reality! Other fields of science follow the same pattern. Geologists date fossils at billions of years. Astronomers discover new galaxies which they say demonstrate “eons” of time. They describe the solar system all starting with a swirling cloud of gas. Microbiologists, biochemists, and biophysicists describe the evolutionary significance of DNA similarities, reverse transcriptase amino acid sequencing, and histone densities in chromosomes. The bottom line is that evolution is a fact a priori ! Its fine points will be all worked out later. If discrepancies crop up, they are pushed aside in denial of the evidence. “Man came from an ape,” says the evolutionist, who is confident that the ape-man “missing link” will be dug up somewhere. Just give it enough time and this will all be worked out! One of the primary concepts for the beginning student of evolution is comparative embryology. A beginning biology course is actually a beginning evolution course. The following example is typical of the deceit required to introduce evolutionary theory. In this illustration,3 the student is shown a series of embryonic comparisons to prove evolution at work. These drawings were originally produced by an embryologist by the name of Haeckel. These essentially identical embryonic forms are from a wide variety of organisms, i.e., reptile, fish, bird, and human. The student is expected to assume that humans repeat their evolutionary past as they develop in the uterus. "Evidence" of evolution from comparative embryology. (Fig. 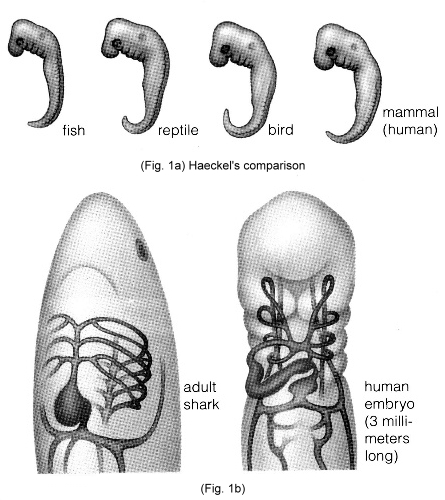 1a) Very early embryos of vertebrates retain striking similarities. (Fig. 1b) Fishlike structure still form in early embryos of reptiles, birds, and mammals. For example, a two-chambered heart, certain veins, and portions of arteries called aortic arches develop in a fish embryo and persist in adult fishes. The same structures form in an early human embryo. Haeckel's drawing of his "embryo of man in the fish stage." (Fig. 3) Note that more than half of the essential organs have been removed or mutilated in order to make the human embryo (Fig. 2) more closely resemble those of the fish, reptile, and bird (Fig. 1a). What are we to make of the “scientific” evidence claiming extraordinary age for the earth? Evolutionary chemists use radiometric techniques to “prove” this planet to be about 4.8 billion years old. A favorite method is the potassium-argon system, used to date many fossilized specimens. The layers of gradual accumulation of sediments “over millions and millions of years” gives vivid “proof” of an ancient earth. These layers are dated using “state of the art” methods firmly establishing, they say, the notion of gradual evolutionary change; the simple, older organisms at the bottom and the more complex, younger life forms at the top. According to evolutionary thought fossilized remains have been entombed in sediment over millions of years, leaving a record of gradually evolving life forms to “prove” that evolution carefully molded every living organism. It is known that a frothing phenomenon in a liquid environment, such like what a global deluge would cause, rapidly leaches out potassium and argon isotopes, much like dunking a tea bag rapidly into 20 cups of hot water. (Certainly, there isn’t much “flavor” left after the twentieth dunking!) The remaining potassium and argon isotopes in rocks are the very ones which, because of their small remaining concentrations, allow evolutionists to claim an ancient earth. On the contrary, it is on account of the leaching of these precise isotopes in a probable violent flood that rocks have these minute concentrations, not because they are billions of years old. If one examines the barrier reef along each continent the fit is nearly perfect except where major rivers dumping tons of sediment, like the Amazon, affect the topography. But, if evolutionary geographers are correct in their time-frame, the sediment from the Amazon over millions of years suggests that the shoreline of South America should look something like this (Fig. 5). The Genesis account of the flood provides a better explanation in the massive upheavals which tore the continents apart, most probably only recently. The committed students of the theory of evolution are too deeply immersed to be concerned about these minor discrepancies that destroy the entire theory. Having personally examined thousands of x-rays, I have noticed certain tendencies in bone structure which correlate with old age. The skull cavity and facial bones become more prominent with age. Older humans have a different appearance than their younger counterparts due in part to these characteristics. Examine the human skull fragments pictured and note the predominant orbital bones. Evolutionary anthropology interprets these to be our ape-like ancestors. Sacred Scripture, however, records humans with longevity far beyond modern man’s lifespan. The more aged the individual, the more prominent the orbital bones. "The footprints, apparently made by two adults and a child, were so clear,” Mary Leakey said afterward. “They could have been left this morning.” In fact, they had been preserved in hardened volcanic ash at Laetoli in the Serengeti Plain in Tanzania for 3.6 million years and the primates that left them were not human —at least not quite. How can Ms. Leakey state so dogmatically the age of these footprints? We have seen how 200-year-old volcanic residue yields grossly distorted ages! How would she explain the documented fact23 of the discovery of dinosaur and human footprints fossilized in the same rocks even though evolutionists like her claim that humans arrived 70 million years after the dinosaurs became extinct! Another remarkable fact: a human sandal print fossilized with a crushed trilobite which evolutionists claim became extinct hundreds of millions of years ago. These seldom-mentioned discoveries and hundreds more like them telescope the earth’s history into a period of time of thousands of years instead of millions or billions. Evolutionists can’t accept this. This seems to show incredible imagination! Previously, in 1959, working in the Olduvai Gorge near the Tanzania-Kenya border, Leakey had unearthed and pieced together 400 fragments of a skull from a 1.75 million year old proto-human, pushing back the time line of human evolution by more than a million years. We can imagine Ms. Leakey on her hands and knees at the bottom of a gravel pit slowly and tediously picking and cataloging each fragment. Then begins the tedious job of assembling the skull. Finally the skull is assembled, the missing areas of skull are filled in, an artist is contacted and a picture of this early pre-human is soon available just in time for a press conference. If you were to spend your life picking up bones and finding little fragments of head and little fragments of jaw, there is a very strong desire there to exaggerate the importance of those fragments. Is it only coincidental Ms. Leakey’s discovery came when the Leakey’s research funding was nearly exhausted? Four hundred bone fragments in the hands of the right person could produce a workable model of the Titanic. As new physical discoveries are made, the theory of evolution has to adapt. In 1989 a “glucose pump” was discovered in certain mammals. Existing in mammalian cells, hundreds of these molecules “pop” up into the membrane of skeletal muscle cells to crisscross the cell membrane several times over. When activated by insulin, glucose is actively pumped into the cells, thus lowering blood sugar. When insulin levels drop the “glucose pumps” drop back inside the cell. Evolutionary molecular biologists estimate that this process alone required 20-45 million years to evolve. St. Thomas teaches that only something already in motion can cause another thing to move. He also points out how potential (potency) becomes action (act) by another thing already in act. If we trace the chain of movement backwards, we find that there must have been a first mover (i.e., something in act) from which all potency becomes act. This is the conclusion of St. Thomas’s more down-to-earth version of the cosmological argument. But what if we maintain that movement is an inherent property of matter? This objection contradicts the laws of physics that “a body at rest will continue at rest forever unless compelled by some force to move.” Secondly, the question regarding where motion first came from remains unanswered. The premise is assigning the status of “God” to matter itself. The teleological argument —the argument of final ends —for a vastly superior intelligent first mover has different aspects. All deal with the ordering of things to some end or plan. The other aspect deals with the incredible order and complexity present in the world, which argues for an incredibly intelligent and powerful Creator. Ironically, the cult of Environmentalism [The Angelus, March, 1996] readily admits to the facts used to demonstrate the existence of God, and to refute the materialist foundation of this same group. Environmentalists tell us of the wonderful and widespread order that exists in nature, and that could be even better if man would leave it alone. They love to tell us of the self-sustaining complexities of biosystems on both the macro and micro scales. Further, they do us the favor of emphasizing that man indeed is not a necessary part of this system, but that it operates according to design. Where did all this wonderful and complex order come from? Environmentalists answer that it all evolved by chance from lifeless matter. Once again we have the same problem as before, only now a little further down the road. What caused matter to begin to move in the first place, and who organized it to produce life? The law of entropy is that everything in nature tends towards its least energetic and organized state. It is impossible for something unorganized to become organized by itself, or for life to come from non-life. Environmentalists and evolutionists alike are forced, if they consider these things openly and honestly, to admit the existence of a Supreme Being. For there shall be a time when they will not endure sound doctrine, but according to their own desires they will heap to themselves teachers, having itching ears, and will indeed turn away their hearing from the truth, but will be turned unto fables (II Tim. 4:3-4). An excellent online source on the subject of creation vs. evolution is the Center for Scientific Creation (www.creationscience.com). Though the author, Dr. Walt Brown, is a Protestant, nevertheless, his scientific analyses are objective. The Troubled Waters of Evolution (San Diego: Creation-Life Publishers, 1974, p.42) Dr. Henry Morris. The Surrender to Secularism (St. Louis: The Cardinal Mindzenty Foundation, Inc.,1967. p.11). Richard Bozarth, “The Meaning of Evolution,” The American Atheist, Vol. 20, #2, February 1978, p.30. H. S. Lipson, FRS (Professor of Physics, University of Manchester UK) "A Physicist Looks at Evolution,” Physics Bulletin, Vol. 31, 1980, p.138. Dr. David M. Raup (Curator of Geology, Field Museum of Natural History, Chicago), “Conflicts Between Darwin and Paleontology,” Field Museum of Natural History Bulletin, Vol. 50(1) Jan. 1979, p.25. David B. Kitts, Ph.D. (Zoology) “Paleontology and Evolutionary Theory,” Evolution, Vol. 28, 1974, p.467. G.A. Kerkut, Ph.D. (Physiology, Biochemistry), Implications of Evolution, Pergamon, 1960, p.148. Loren Eiseley, Ph.D. (Anthropology) “The Secret of Life,” Immense Journey, Random House, New York, 1957, p.199. John Wiester, Chairman, Science Education Commission American Scientific Affiliation as quoted in the Wall Street Journal Letters, September 25, 1996. Stephen Jay Gould “Racism and Recapitulation,” Natural History 84 (6) June-July, pp.18-25. Francis Hitching, The Neck of the Giraffe: Where Darwin Went Wrong (New Haven, Connecticut: Ticknor and Fields, 1982) p.204-205. Wallace Johnson, The Case Against Evolution, CCCR Press, 1976, p.16-17. Dr. Henry Morris, The Troubled Waters of Evolution. Wallace Johnson, The Case Against Evolution, CCCR Press, p.31. Frederic B. Jueneman, FAIC, “Secular Catastrophism,” Industrial Research and Development, June, 1982, p.21. William D. Stansfield, Ph.D. (Biology), The Science of Evolution, MacMillan, New York, p.82, p.84, 1977. Robert Jastrow, Ph.D. (Physics), Director Institute for Space Studies USA; “The Dinosaur Massacre,” Omega Science Digest, March/April, 1984, p.23. Stephen Jay Gould (Professor of Geology and Paleontology, Harvard University) “The Validation of Continental Drift,” Ever Since Darwin, Burnett Books, 1978, pp.161-62. Professor Henry Fairfield Osborn, Natural History Museum, New York. Illustrated London News, June 24, 1922. Wallace Johnson, The Case Against Evolution, CCCR Press, 1976, p.18-20. George Mulfinger and Donald Snyder, Earth Science for Christian Schools, Bob Jones University, Greenville, South Carolina, 1979, p.290. St. Thomas Aquinas, Summa Theologica, I, Q.2, A.3.